Can the Cleveland Cavaliers win the NBA Championship? Can the Cavaliers win the NBA Championship? When you have LeBron James on your team, you are always a contender for a championship title. James has taken his team to the Finals six years in a row, and all things being equal, he is destined for another Finals appearance. Can the Cavaliers win the NBA championship? The answer is yes and no. There are several factors that need to go in their favor for them to win the title. Here is a breakdown of the chances the Cavaliers win the NBA championship.pionship. Do you know how much are NBA Cleveland Cavaliers worth? How much are Cleveland Cavaliers worth? The Cleveland Cavaliers have never been one of the highest value teams in the league. Even in Lebron’s first stunt with the Cavs, the highest value the team could muster was $477 million, and that was in 2009, just one year before Lebron James left the team. After he left, the value of the Cavaliers went down. So how much are the Cleveland Cavaliers worth now? But it seems that with the return of Lebron James, and with the championship ring now won, the Cavaliers are headed for higher ground. Forbes ranked the Cavaliers No.12 in value for 2016, estimating that the team is worth $1.1 billion. Top 5 Clippers Games in January will feature Lebron James, Dwight Howard, Derick Rose and Chris Bosh. 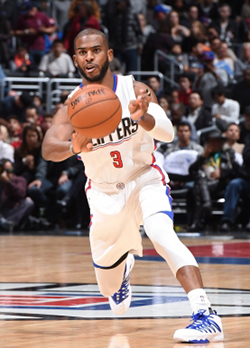 The Clippers will play fourteen games in January 2016 and are looking to improve on their fourth seed position in the Western Conference. The Miami Heat visit the Clippers for their first duel of the season. Chris Bosh and Blake Griffin are now veteran players at the power forward position. Both have altered their game to become more of a scoring threat from outside of the paint. Bosh is a better 3-pt shooter, but Blake is not far behind. And then you have the duel at the center position between two of the best shot blockers in the league at the moment, Hassan Whiteside versus DeAndre Jordan. Who will have more blocks when the game is over? And we haven’t even mentioned the duel in the back-court that might decide the outcome of the game. The Clippers and Heat is number 5 in the Top 5 Clippers Games In January. The Clippers will make their lone visit to Cleveland in January, and then they will have to wait a little for the King and his company to come to Los Angeles. Tons of matchups can define this game, but it all starts at the point guard position, where Kyrie Irving is slowly coming back from injury. Playing against an old school player like Chris Paul is not easy, but Kyrie is the faster one. The Clippers still do not have a valid defender at the small forward position, which only makes life easier for Lebron James. The Clippers – Cavaliers is number 3 in the Top 5 Clippers Games In January. When the Raptors were in Los Angeles, they completely dominated the Clippers until late in the fourth quarter when the Clippers made the game look close. The final score was 91-80 for the Raptors, as Toronto managed to hold the Clippers to season low in scored points. You can be sure that the Clippers would love to return the favor in Toronto. The last time the two faced, Chris Paul was having one of his worst games of the season. He will have plenty of motivation. The Clippers vs Raptors is number 3 in the Top 5 Clippers Games In January. One can safely say that January is a redemption month for the Clippers, as they will face several foils that have made their life harder so far. To finish the year, the Clippers will face the Bulls, a team that beat them 83-80 in Chicago. Blake Griffin was ejected for flagrant 2 foul in the game, and he wasn’t able to help his team in the last quarter. Will he be able to control his temper now? And what about that duel between Derick Rose and Chris Paul? The Clippers vs Bulls is number 1 in the Top 5 Clippers Games In January. 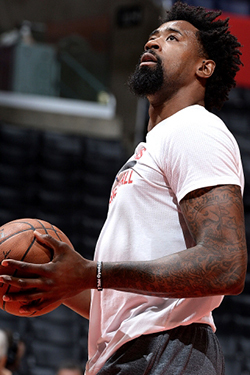 For the Clippers, beating the Rockets at least once this season will be a confidence booster. The Rockets might not be the team from last season, but they have managed to dominate the Clippers so far. In the first two games of the season, Houston won 109-105 and 107-97. Now, with the last game of the season between the two in January, the Clippers have several reasons to look for revenge. Josh Smith came from the Rockets over the summer, but he still hasn’t managed to make an impact, and his name is already on the trade block. Maybe a game against his old team will make his juices flowing. The Rockets versus Clippers is number 1 in the Top 5 Clippers Games In January as the match up has the potential to be a NBA playoffs preview. Currently the LA Clippers are sitting in the fourth seed and the Houston Rockets are in the seventh seed. The Clippers are 0-2 against the Houston Rockets this season. 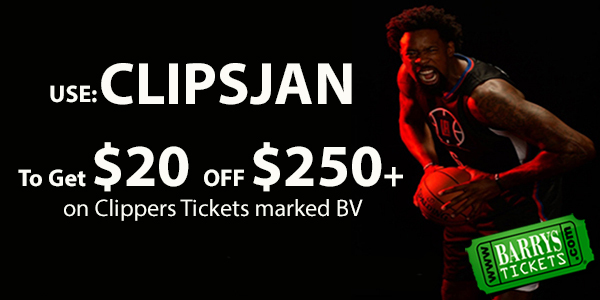 Get $20.00 off your order of $250.00 or more on Clippers Tickets! Use code CLIPSJAN at checkout! Barry’s Tickets is located caddy corner from the Staples Center itself. Located inside the Luxe Hotel it’s a fast, easy and convenient way to pick up or purchase your regular season and LA Clippers playoff tickets even after the tip-off. You can also pick up all Los Angeles basketball tickets, as well as your Sports, Concert and Theater tickets from our office free of any delivery charge. 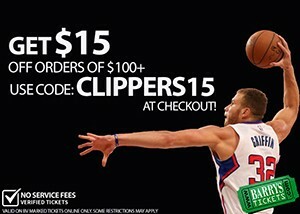 You can also purchase Clippers Courtside Tickets for all games. You can view the Clippers December schedule as well as purchase LA Clippers game tickets. You can also use our LA Clippers seating chart to help you decide on tickets by viewing the court from all sections at the Staples Center. You can see the complete LA Clippers January Schedule of games at the Staples Center. The 5 Best Individual NBA Matchups in December is strict as there are so many great NBA games including the Christmas matchups. Here is our look at the 5 Best Individual NBA Matchups in December. The number one Best Individual NBA Matchups in December. Lebron James will be the host of this one, but when these two play each other, the venue doesn’t change much. A year ago, they were considered the best two players in the NBA, with James being 1A and Durant 1B. It is hard to find a flaw in the game of either one and every time they face each other; it comes to nuances and single moments that decide the winner. Durant has also improved his defensive play to the point he now guards James on most of the possessions. On the other side, James always takes the challenge of guarding the best player on the opposing team. Back from his foot injury, Durant is posting numbers that we are used to seeing: 28ppg on 53% shooting overall and 47% from behind the lane. James has always been a more all-around player with rebounds and assists on his resume. Cavaliers vs Thunder tickets start at $65.00. The number two Best Individual NBA Matchups in December. The game will be played in New Orleans, in what will be a battle of old versus new. Marc Gasol is arguably the best all-around center in the league right now, with Davis being the younger, more athletic and explosive player that would love to have that crown. To make things more interesting, both Gasol and Davis are as great defensive players as they are offensive. Few people can guard Gasol, as he has a plethora of moves, and he can also pass and facilitate the offence. Davis is not on that level yet, but he is as explosive as they come. And he now shoots 3s, which will take Gasol out of his comfort zone in the paint and force him to guard Davis at the perimeter. Simply put, a joy to watch. Pelicans vs Grizzlies tickets start at $5.00. The number three Best Individual NBA Matchups in December. In the words of Dirk, “The kid is for real”. If there is one young player that resembles Dirk and his play that is Porzingis. The young Latvian player was heavily criticised for going so high to New York, but his play in the first month in the NBA has proven doubters wrong. He is big, quick, has a nice soft touch from outside, and can rebind and defend. Or in other words, everything Dirk can do, Porzingis can do as well, in addition to his great shot-blocking ability and defence. It is hard to see this turning into a shooting matchup between the two, as Carmelo might swoop in to take the spotlight, but if Kelly Olynyk could give Dirk his signature one leg stepback jumper, Porzingis can show the German he has soft touch as well. Mavericks vs Knicks tickets start at $74.00. The number four Best Individual NBA Matchups in December. The rivalry between these two goes back to their high school years as they managed to pack the venues and get national TV coverage for their duels even then. They went 1 and 2 in the 2003 Draft, and while many expected the two to battle for championship head to head, that hasn’t happened yet. James got two rings with Miami, while Carmelo is still looking for his first. And if there is one scorer that James has troubles guarding, that has to be Melo. The only thing that could make this matchup even more interesting is if the home arena was Madison Square Garden. Sadly, it isn’t, but that doesn’t mean these two won’t put on a show. 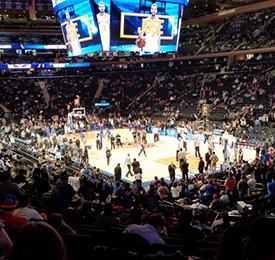 Cavaliers vs Knicks tickets start at $62.00. The number 5 Best Individual NBA Matchups in December. We had to put someone’s name in this matchup, but you can say this is as best as they come. Spurs versus Clippers is an epic NBA matchup, as both teams are covered on every position with players that are as competitive as they come. Parker versus CP3, Danny Green versus Redick on the shooting, and then you have Duncan and Jordan in the paint. Speaking of Griffin versus Aldridge, these two were in the competition for best power forward in the league for quite some time, and they still are. Griffin is the more powerful player, while LaMarcus has that sweat touch from 18-feet that Blake is trying to add to his repertoire. 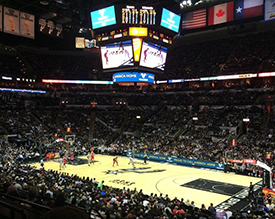 Spurs vs Clippers tickets start at $60.00. Don’t miss any NBA action this year! Use our NBA Tickets discount code and save up to 25% off NBA Tickets! The Los Angeles Clippers will play 41 games at the Staples Center the following season. And in those 41 games, there will be lots of excitement, drama, tough play, highlights and much more. Now, it would be best if you can attend all 41 home games. However, if you absolutely must choose, we present you seven Clippers games that are absolute must-attend. Many will ask why an Eastern conference team with low chances to end up in the playoffs qualifies as a must-attend game. Well, the Pistons feature one of the best young centers in the league in Andre Drummond, and seeing him going against DeAndre Jordan is an absolute joy to watch. The Pistons will also be a team that will try to push the pace and run the floor, surrounding Drummond with shooters from almost every angle. If that is not enough, you also have the young, up and coming Reggie Jackson, the point guard that finally has his team. Can he rise to the challenge of going against CP3? View all Clippers vs Pistons Tickets. This will be the second game that the real champs and Clippers meet. The first time will be on November 4 at Oracle Arena. And you can bet that there will be some drama between the two teams, especially after the saga regarding Los Angeles Clippers Coach Doc Rivers comments whether the Warriors were lucky or not to win the title. Last year, the Warriors beat the Clippers 3 out of 4 games, and this year, the Clippers will look to improve that record. And when it comes to drama and provocations, the Clippers now have Paul Pierce in the lineup. The Clippers will also be looking for revenge as they lost their first meeting against the Warriors at the Oracle Arena 108-112 on Wed November 4th. View Clippers vs Warriors Tickets. With Kevin Durant and Russell Westbrook healthy, the Thunder will again be one of the teams aiming for top spot in the West. The Clippers have the same goal, and this will be the first game between two heavyweight teams in the West. Who will emerge victoriously? The Clippers or the Thunder? The Clippers now have more players that they can throw at Kevin Durant, including Lance “ear-blowing” Stephenson. View all Clippers vs Thunder Tickets. The Clippers and the Lakers will play on Christmas, but the Lakers are the “home” team in that game. The January game will be the first time that the Clippers will qualify as the host. The city rivalry between the Lakers and the Clippers might finally be evenly matched this year, with the Lakers also boasting a good team. In past years, either the Clippers or the Lakers were the dominant team. This year, however, the Lakers might end up in the playoffs. And if that isn’t enough, watching Kobe Bryant in what might be his last season in the league is a bonus. View all Clippers vs Lakers Tickets. The Bulls are among the contenders in the Eastern Conference, and this year, they will try to push the pace a little more. With a new coach who is more offensively minded, the Bulls might present a different challenge. They have a plethora of great players that they can throw at the Clippers. Not that the Clippers are a slouch. The duel between these two is as evenly matched as possible, which only amplifies the potential for a dramatic game. View Clippers vs Bulls Tickets. The second game the Clippers will host against the Warriors is the third game between the division rivals. With the season in its second half, we will have a better sense of where the teams are positioned. This will be the second game the Clippers play after the All-Star break, having previously welcomed the San Antonio Spurs. View Clippers vs Spurs tickets. Lebron James makes his lone visit to Los Angeles, and he will be welcomed by some of his old rivals in Paul Pierce and Lance Stephenson. The Cavs are arguably the best team in the East, and if you want to become a champion, you need to beat the best. There are countless of duels and matchups worth watching, including the point guard duel between CP3 and Irving, the PF duel between Love and Griffin, or the duel at the center position between Mozgov and Jordan. Fasten your seatbelts and enjoy! View Clippers vs Cavaliers tickets. Clippers Games prices are subject to change. If you want the best deal, come to Barry’s Tickets first. The National Basketball Association released the NBA official schedule for the 2015-2016 season, and as always, NBA Christmas Day schedule and games are cream of the crop. Many people believe that the official season in the NBA starts after Christmas day, when teams get their feet wet and contenders emerge, while pretenders fall back in the standings. Here are five reasons to tune in on Christmas Day and spend the day and the night watching basketball. The NBA Christmas Day Schedule kicks off with the Heat hosting the Pelicans and the young rising star, Anthony Davis. This will be the first time fans get to see Davis play on a Christmas day, and the young star will surely not disappoint. The Heat are regulars on Christmas day for the past several years, and they always put on a show. This year’s Christmas day games will be competitive, with almost every team making the playoffs the year before and watching Davis probably destroying the Heat is a nice appetizer. Since the World Cup in 2010, Chicago’s Derrick Rose and Kevin Durant from the Thunder have been marketed as the next generation stars in the NBA. And While Durant has established himself as one of the top 5 players in the league, Rose won an MVP award following the World Cup, but has been injured ever since. The Thunder and the Bulls were and still are up and coming teams, and they have had several Christmas day matchups in the past few years. The two teams play either on opening night, or on Christmas. And since they meet just twice during the regular season, watching them on Christmas makes it that much more special. The Cavs at Warriors matchup is the highlight of the NBA Christmas day schedule. This will be the first time the two teams meet after the Finals, and this time, the Cavs might be healthy. With Love, James, Irving, Curry, Thompson, Green and Iguodala, there are more than enough stars on the floor to entice your attention. Toss in Lebron’s motivation for revenge, and this might turn into a playoff atmosphere game, if not Finals atmosphere. By Christmas, we might even know the roster for Team USA, and both Curry and Irving compete for a spot. If one of them doesn’t make the cut, he will definitely have a reason more to go at the other. The battle for supremacy between Texas teams is one of the most interesting and intriguing in the league. The Christmas Day schedule will take us to Houston, where the Rockets will welcome the new, refreshed Spurs team that is hoping to get back to the Finals. The Rockets have the same goal in mind, with this being a crucial year for them as Dwight Howard is nearing free agency. The Rockets have their own Big Three in Howard, Harden and Ty Lawson. And if Lawson manages to keep his head in the game, the race to the division title in the Southwest division might be one for the ages. It is the swan song for Kobe Bryant, one of the best players in the past 20 years. Bryant left a significant stamp on the league, and this might be the last time fans get to see him on Christmas. Kobe has hinted this might be his last season in the league, and it will all depend on his health at the end of the season. But coming back from serious injuries the past two seasons, one has to wonder how long till Kobe says enough is enough. The Lakers Clippers game is the last game on the 2015 NBA Christmas Day Schedule. NBA Finals Game 2 – Cavs get franchise first Finals win, can they win 3 more? The Cleveland Cavaliers, led by Lebron James, won their first Finals game as a franchise. This is just the second time the Cavs are in the Finals, and the last time they were here, the team was smoked by the Spurs 4-0. This time, however, Lebron James is more mature, with 2 rings on his hands, and is ready to take the challenge. The first two games showed a lot of patterns, and the question now is can the Cavs win three more games and bring that elusive title to Cleveland. Here are some things we learned from NBA Finals Game 2 which the Cavs won 95-93 in overtime. During these playoffs, Matthew was heavily criticized by fans about his dirty play, and alleged intentional fouls and run-ins. So far, three victims fall to his play, including Chicago’s Taj Gibson, and Atlanta’s Kyle Korver and Al Horford. When the reports of Kyrie Irving’s injury went online, there was a meme showing Dellavedova thinking about his next target, Steph Curry. But Matt showed in Game 2 he is more than what many consider a dirty player. He was all over Curry in Game 2, contributing to the final stat sheet of the MVP, which read 19 points on 5-23 shooting. Dellavedova also contributed 9 points in 42 minutes of action, and had the second highest +/- on the Cavs at 15. The highest was scored by James Jones (+22). In two games, the Cavaliers have managed to set the pace, and slow down the Warriors significantly. The pace plays into Cavs favor, as they prefer half court battles rather than up-tempo style, especially now Kyrie Irving is missing the Finals. The teams have scored combined 496 points, 201 by the Warriors and 195 by the Cavs. The Warriors averaged more than 110+ points in the regular season, and they would love to get back to that pace. The Golden State Warriors trailed 83-72 with little more than 3 minutes remaining in the fourth quarter, but Kerr decided to go to a Shaq-a-Hack tactic. After Iggy hit a 3-pointer, Curry fouled Thristan Thompson, made a 3, and then fouled Thompson again. The power forward sank 2 of his 4 free throws in the NBA Finals Game 2. J.R.Smith then fouled Curry, who sank two of his free throws, resulting in a short burst of 8-2 in Warriors favor. They managed to close the gap with the tactic, which greatly helped them force the overtime. We are all humans, including Lebron James. The isolation heavy offense is draining Lebron James, and the question is how much he can handle. It was evident in the fourth quarter that James is not at his best, since he was missing some easy and open shots. James played 50 minutes, had a triple double with 39 points, 16 rebounds and 11 assists, but the general feeling is that in the long run, this type of play might eventually help the Warriors. James already has an experience playing almost alone versus a great, deep team in the Finals, and it might be the same result. All NBA Finals Tickets are guaranteed to be authentic and delivered on time! The first question the Golden State Warriors will have to answer when they step on the court of the Oracle Arena in Game 1 is how they can stop or at least slowdown Lebron James. The former MVP has been sensational during the playoffs, completely eviscerating teams like Chicago Bulls Game Seats and Atlanta Hawks. James is surely a top candidate for a playoffs MVP, and if the Cavs win, he will get the Finals MVP trophy for sure. When James is at his best, attacking and creating for others, few teams can slow him down. But the Warriors had the best defence during the regular season, and they are pretty solid in the playoffs as well. The first one to get a crack at James will probably be Draymond Green. He is the Warriors best defender, versatile enough to defend positions 1-4 and probably centre as well. He has the length, the quickness, the craft and the strength to play James on the perimeter, and in the post as well. In the past two finals, Kawhi Leonard, a player very similar to Draymond Green had great success versus James. Leonard was not alone, as the Spurs backed him up, and every time James drove past Kawhi, he was greeted with another defender. The Warriors might try to replicate the strategy and try to force James to be a jump shooter. He has little success from outside of the paint in the playoffs so far, and he is abysmal from 3-pt range, shooting just 17%. Lebron James played in just one game versus the Warriors the past season, and if that game is any indication, the Warriors are in trouble. He scored a season-high in that game, guiding the Cavaliers to a 110 – 99 win. James shot 15 – 25 from the floor, and his aggressive play resulted in 11 free throws. The forward hit 8 of those free throws, and he also had a bunch of assists and rebounds to fill up the stat sheet. While the Cavs had to face few NBA All-Star Game Tickets, and they had to go through more team-oriented teams, the Warriors fought with 3 of the five All NBA First team members. James will be the fourth player from that company, and the fifth member is Steph Curry. In the first round, the Warriors stopped Anthony Davis, an MVP candidate. He did average 31 points and 11 rebounds, but the Warriors limited all other players from the Pelicans, leaving Davis alone. In the second round, the Warriors went through Memphis Grizzlies Tickets. The star center got his points, averaging 18+, but he was inefficient. The Warriors limited Gasol to less than 40% from the floor. Their best team defensive effort came versus MVP runner-up, James Harden in the West Finals. The Warriors managed to keep Harden to under 20% shooting in two games, allowing him to score just 17 and 14 points in those matchups. While many will expect Draymond Green to do all the dirty work on James, the reality is that it will require a team effort. The good thing about the Warriors is that they can employ more than three 6-6 6-7 players on the floor at all times, giving them the versatility to switch on James constantly. By throwing different defenders, the Warriors will hope to keep Lebron James out of rhythm. And whenever he droves past his defender, have Andrew Bogut at the rim waiting for him. The best news for the Warriors is that Kevin Love is injured. This allows the Warriors to crowd the paint, and keep two defenders there at all times. Tristan Thompson is doing an admirable job of replacing Love in the playoffs, but he doesn’t have the range to spread the floor. And as long as the paint is packed, James might be forced into outside shots. Checkout the Top 5 Golden State Warriors Games in January for savings on Warriors tickets. NBA Finals Game One Would you spend $23,403,00? NBA Finals Game One: Would you spend $23,403,00? With the NBA Finals Tickets Game One starting tonight at the Oracle Arena between the Warriors and Cavaliers tickets the average ticket price for NBA Finals Game One on the secondary market has hit $1250.00 per seat. While $1250 per ticket is still extremely high, it has lowered -3.84% from $1300.00 per ticket where it topped out. That is a 1030.43% increase in average ticket price for Warriors game on the secondary market during the regular NBA season. The Golden State Warriors Ticket prices on the secondary market climbed by over 57% this 2014-2015 season and averaged $115.00 per ticket where last season the average ticket price was $80.00 per ticket. The most staggering number of all is back in 2010 the average Golden State Warriors ticket price was $40.00 per ticket a 3025% increase in ticket prices on the secondary market to see a Warriors Game in the Finals. It’s also a 58407.50% increase if you wanted to sit court-side tonight at $23, 403.00 according to Stubhub’s website. Those are Warren Buffett Berkshire Hathaway stock increase type numbers. While 99.99% of the world can’t afford the NBA Finals Game One $23,403.00 court-side seats to what might become one of the best NBA Finals of all time the average price to get in to the Oracle Arena tonight is starting at $670.00 currently which is still a 482.60% increase in prices on the secondary market from the Warriors regular season average. You can get them as cheap as $250.00 a ticket bidding on eBay. While individual sites such as VividSeats shows get in at $479.00 per ticket and good seat tickets show $551.00 per ticket when you get to the end of the sale there is a “service fee” which can add as much as 35% on top of that price. 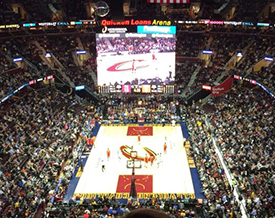 If you wanted to head to Cleveland to the Quicken Loans Arena, you can get into the NBA Finals game for just $390.00 per ticket or choose to sit court-side at the Warriors vs Cavaliers NBA Finals game which is running 22,281.00 per ticket a savings of 2.5% overseeing the games in Oakland. During the regular NBA season the Cleveland Cavaliers opening day ticket prices Cavaliers Ticket price average on the secondary market averaged $240.00 per ticket. The 2013-14 NBA Finals between the Miami Heat with Lebron James and the San Antonio Spurs averaged $950.00 per ticket. The 2011 NBA Finals with the Miami Heat vs Dallas Mavericks averaged $750.00 per ticket on the secondary market. The 2010 NBA Finals Game One between the Lakers can Celtics court-side tickets hit $30,000 on the secondary market. You can also check out the 10 Most Expensive NBA Games of 2014-2015 season to sit courtside at.